Ethanediolic acid; Dicarboxylic acid; Salt of sorrel. · Oxalic acid, the simplest dicarboxylic acid, is a potentially naturally present as a salt in many plants. Oxalic acid is a relatively strong acid, and forms a white, dihydrate precipitate. 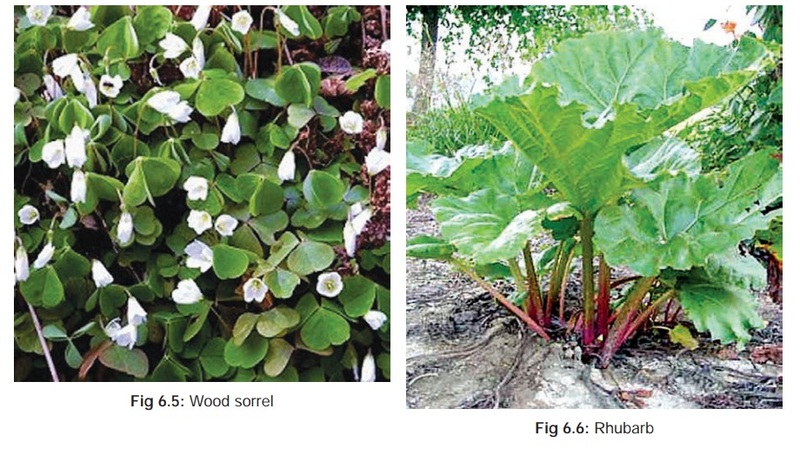 · Oxalic acid occurs naturally in plants and vegetables such as wood sorrel (Fig 6.5), rhubarb (Fig 6.6), and spinach (Fig 6.7). Alkali extraction of sawdust and the metabolism of many moulds will also produce oxalic acid. · Rust and ink stain removers, and ceramics. It is also used in general metal and equipment cleaning, wood cleaning, process engraving, printing and dyeing, bleaching, textile finishing, leather tanning, and photography. About 15 to 30 grams of oxalic acid. Liquid oxalic acid has moderate corrosive action on skin and mucosa. Systemic absorption leads to hypocalcaemia, since it reacts with calcium in plasma, and insoluble calcium oxalate is precipitated which accumulates in the liver, kidneys, heart, lungs, and blood, and is excreted in the urine. Whitish or yellowish corrosion (mucosa), or discolouration (skin), with underlying congestion. The corroded mucosa is often referred to as “scalded” in appearance. Production of acid haematin however can turn the mucosa blackish. Vomiting and diarrhoea, followed by signs and symptoms of hypocalcaemia (tetany), characterised by tonic muscle spasms, cramping, and accoucher’s hand* (Fig 6.8). There is often a positive Trousseau’s**(Fig 6.9), and Chvostek’s*** sign (Fig6.10). Pupils are usually dilated. Later there may be metabolicacidosis, ventricular fibrillation, and renal failure. Calcium oxalate crystals can be deposited in the liver resulting in hepatic necrosis and failure in severe cases. Milder cases may manifest as elevated serum liver enzymes. · Demonstration of urinary oxalate crystals (Fig 6.11) which may occur either as monohydrates (prism or needle-like), or dihydrates (tent or envelope shaped). · Oxalic acid can be measured in the urine by colourimetry. The normal upper limit is 40 to 50 mg/24 hours. · Average serum oxalate concentration is said to be 1.4 mg/L. · Stomach wash with calcium gluconate or lactate solution. · Calcium gluconate IV (10 ml, 10% solution). Dialysis or exchange transfusion for renal failure. · Affected skin or eye should be washed copiously with water. · “Scalded” mucosa of GI tract (especially stomach). Sometimes there is a brown or black colour due to acid haematin. Crystals of calcium oxalate may be demonstrated in scrapings of the mucosa, (examine with polarising mico-scope). · Whitish or yellowish discolouration of corroded areas. · Microscopic evidence of renal damage. · Most cases of oxalic acid or oxalate poisoning result from accidental causes, e.g. mistaking the substance for Epsom salt, sodium bicarbonate, etc. Accidental poisoning may also result from excessive ingestion of certain vegetables rich in oxalates (rhubarb leaves,* sorrel, etc.). Even tea is said to contain significant amounts of oxalate. · Chronic consumption of oxalic acid can lead to renal calculi with consequent renal colic. · Occasional cases of suicide and homicide with oxalic acid have been reported.